Our mission is to raise awareness of midcentury and modern architecture in Lawrence and promote its preservation to ensure that future generations of Lawrencians will have significant examples to appreciate and/or to live in. We are fortunate in Lawrence to have many interesting midcentury houses and buildings. The proximity of KU’s Architecture Department, led by George Beal, was especially influential in this regard. Beal, along with Curtis Besinger, was a modernist and friend of Frank Lloyd Wright, who regularly visited KU on his way to and from Taliesin West. They influenced a generation of KU architecture students, some of whom got their first commissions here. Examples of their residential work are featured in our “Baker’s Dozen” pages. Since forming in 2002, Lawrence Modern has grown to more than 175 followers. 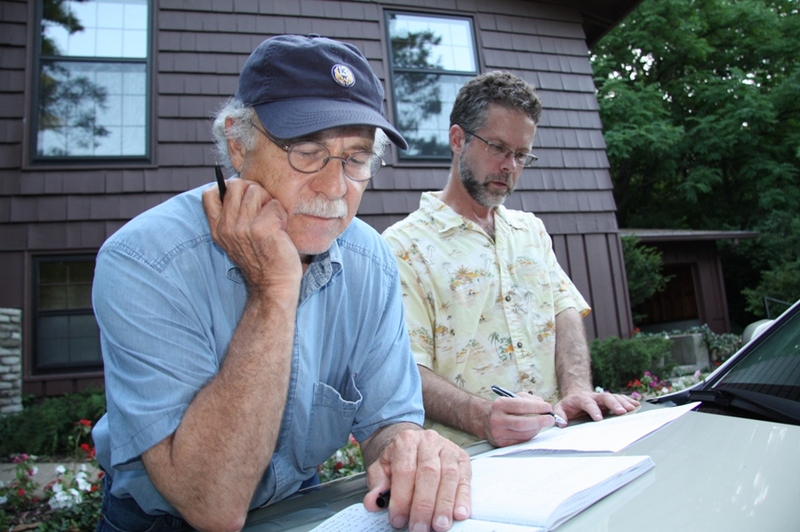 In 2009, KU architectural historian Dennis Domer, with the help of locals Tom Harper and Bill Steele, spearheaded an extensive two-year survey of modern houses in Lawrence, providing the basis for this website. In 2015, Prof. Tim Hossler in the Department of Design joined our “team”. Melissa Meyer designed the site and logo. Terri Erickson drew the Double Hyperbolic Paraboloid. The KU Spencer Library provided invaluable materials and support. Without their help, and the generosity of many others in the Lawrence community, this site would not have been possible. Lawrence Modern usually meets quarterly on Sunday afternoons. In addition to our modern house gatherings, we have a monthly book club and more recently have added a film series held at The Forum in Marvin Hall during the fall and spring semesters. If you are interested in attending our gatherings, book club, or attending our film series please e-mail us and we will add you to the Lawrence Modern e-mail list or follow our blog.